For anybody with hearing loss, articulating the isolation it causes is almost impossible. For a child, it’s even harder. But a new virtual reality (VR) experience, designed to immerse users in a playground and classroom as a child with hearing loss, is helping to foster empathy in parents, teachers and other students. “They didn’t think I could hear so little,” eight-year-old Tyler Potaka said of his peers. Tyler has bilateral mild to moderate hearing loss, meaning he has hearing loss in both ears. For his mother Philippa, the experience wasn’t quite so matter-of-fact. “It was very emotional to put your mind and your head and your body and transplant into your own child and to experience what they see and hear, or don’t hear. 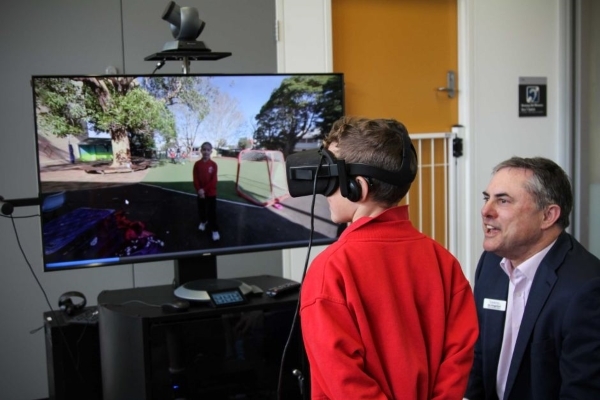 The VR project was launched by Sydney charity The Shepherd Centre and filmed at a Newtown primary school. Nick Hunter, the creative director from innovation company Paper Moose which led the design, said the VR team worked with audiology specialists to accurately recreate how hearing loss sounds. “You start in the playground and the audio is quite muffled,” he said. After experiencing the muffled audio in the playground, the user is moved to the classroom where the teacher asks you a question but you’re unable to understand. “When the whole experience was finished, and we sat down and watched it in its entirety, I found it surprisingly emotional at how isolated and vulnerable I felt,” Mr Hunter said. Dr Anne Fulcher, principal listening and spoken word specialist at the Shepherd Centre, said she believed the technology was so powerful that it could lead to better clinical outcomes. “It’s wonderful to help new parents to see the impact of hearing loss and why it’s so important to help them with amplification and early intervention as soon as possible,” Dr Fulcher said. And the benefit came from empathy, which would encourage parents and carers to intervene earlier, she said. “A lot of the families say they don’t want their children to wear devices because it makes them look different and the kids will bully them. While the technology is offered at The Shepherd Centre, Dr Fulcher said the team would work towards sharing it with schools and government bodies.